The new anti-ship missile has over twice the range of its predecessor, revealed in 2014. China showcased a new submarine-launched anti-ship cruise missile (ASCM) with an extended range at the 2016 Defense Services Asia (DSA) exhibition that took place from April 18-21 in Kuala Lumpur, Malaysia, IHS Jane’s Defense Weekly reports. The new missile, dubbed the CM-708 UNB, is purportedly a derivative of a longer-range version of the submarine-borne YJ-82 ASCM, a rocket-propelled missile launched in a buoyant capsule, with an estimated range of 30 to 40 kilometers (18–24 miles). The CM-708 UNB, produced by the China Aerospace Science and Industry Corporation (CASIC), allegedly has a range of about 290 kilometers (180 miles) — more than twice the range of a similar ASCM revealed in 2014, the so-called CM-708 UNA, which has a range of 128 kilometers (79 miles). A 1,200 kg ‘torpedo’ carrier launches the 5.05 m and 700 kg missile, which has a speed of Ma .08 to Ma .09 and uses integrated INS/Satellite and millimeter wave radar for guidance. It is armed with a 155 kg warhead and in its terminal phase flies 5-7 m above the water. Like the CM-708 UNA, the CM-708 UNB is likely designed to target medium-to-large vessels and could pose a danger to U.S. carrier strike groups. “The CM-708, encased in a torpedo like case, is shot out from the submarine’s torpedo tube, through the water and into the air. The missile then breaks free of its casing, fires its booster and then engine, and flies out to hit its target ship,” Popular Science explains when describing the 128 kilometer variant of the ASCM in 2014. If the new ASCM’s range proves accurate, it would put Chinese submarines at a safe distance from most anti-submarine warfare systems. 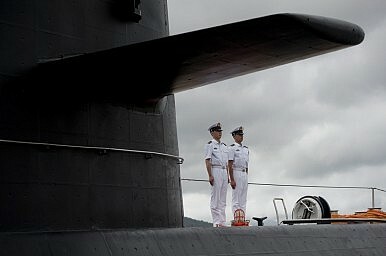 The domestic version of the missile is (or will) likely be deployed aboard China’s conventional submarine fleet, which consists of 13 Song-class (Type 039) diesel-electric attack submarines and 13 more advanced Yuan-class (Type 039A) submarines equipped with air-independent propulsion (AIP) systems. The new CM-708 B could also be deployed aboard Type-093G Shang-class nuclear-powered fast-attack submarines. Potential international customers could include Thailand and Pakistan. During the Defense Services Asia Exhibition, China also revealed the LC63, an export version Type 074A Yubei catamaran small amphibious landing craft. Predictions on the Chinese military’s new Army Leading Organ.